Rajnath Singh did not elaborate further or mention the ongoing peace talks between the Central government and the NSCN-IM leadership for a permanent solution to the insurgency problem. 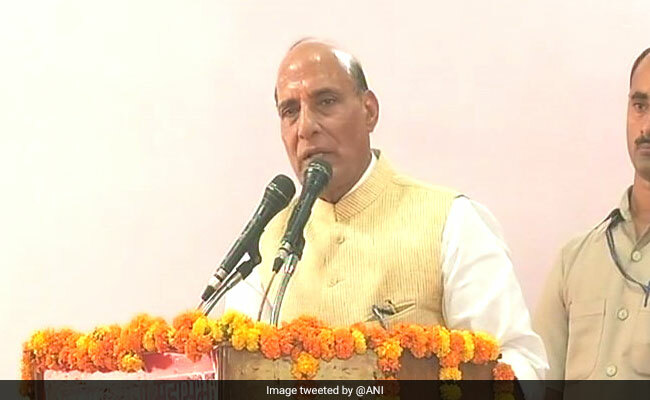 Kisama, Nagaland: Union Home Minister Rajnath Singh today said the central government is committed to do its best to fulfil the aspirations of the Naga people for a brighter tomorrow. The minister did not elaborate further or mention the ongoing peace talks between the Central government and the NSCN-IM leadership for a permanent solution to the insurgency problem. "The central government, under the leadership of Prime Minister Narenda Modi, is committed to do its best to fulfil the aspirations of the Naga people for a brighter tomorrow with all the honour which they richly deserve," Mr Singh said at the Hornbill festival here. The home minister's comment at this Naga heritage village, about 12 km from the state capital Kohima, comes days after President Ram Nath Kovind said Nagaland was at the threshold of making history as a final agreement on the Naga political issue would soon be reached and lasting peace achieved. On September 19, Nagaland Governor P B Acharya said the vexed Naga issue would be solved within the next one or two months. Expectations for lasting peace have gone up in Nagaland, which has been hit by decades of insurgency, after the Centre and the NSCN-IM signed a framework agreement in 2015. Nagaland Chief Minister T R Zeliang told the gathering that time was ripe to bring a permanent solution to the seven-decade Naga political issue. The coming together of all Naga insurgent groups was also a good opportunity for a permanent solution, Mr Zeliang said. Addressing the Naga people at the annual tourism festival, the home minister said the Central government is in the process of finalising a revamped free movement regime on the India-Myanmar border to ensure that people living in border areas face no hardships. "While doing so, steps are also being taken to promote border trade by establishing land custom stations. This would also ensure that illicit trafficking and other illegal activities are curbed at the border," he said. Nagaland shares a border with Myanmar. Under the free movement regime, people living along the border of India and Myanmar are allowed to visit each other's places without any travel document. Mr Singh said Nagaland has the opportunity to lead Northeastern states to the path of peace, stability, prosperity and growth. He expressed the hope for a peaceful, vibrant, colourful and energetic Nagaland that is an example for other states to emulate. The home minister added that Nagaland should look ahead to the future. "Nagaland, with its rich natural resources and talented people, has limitless possibilities. Ensuring peace can help realise the immense potential for economic gains, jobs and prosperity," he said. Stressing that tourism can be a major driver for growth, Mr Singh also focused on the need for infrastructure development as the key for Nagaland to catch up with other states in terms of economic development. Overall connectivity can create opportunities for entrepreneurs and businesses and also make Nagaland the gateway to South East Asia, the minister said.